Simon Munnery, also known by his stagenames of Alan Parker: Urban Warrior and The League Against Tedium, is an English comedy writer and experimental standup comedian. He performs mainly to an alternative audience but has pierced the mainstream both with his BBC Radio 1 show in 1997 and his BBC2 television series, Attention Scum! in 2001. 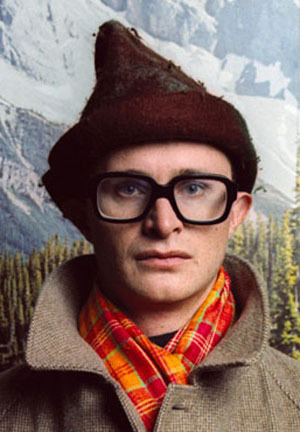 Munnery's experimental style is reified through his sartorial appearance: his tragically unfashionable glasses, homemade clothes (or clothes apparently donated to him by comedian Jeff Green), makeshift props, and dramatic facial hair. As 'The League' he often dons a hat crafted from a kettle and one of his standup shows is performed entirely with a metal bucket over his head. His standup is perhaps best described as often satirical, often political and almost always surreal. Munnery plays harmonica and his dialogue is full of quotable remarks, inviting comparison with Oscar Wilde, ("If you've only ever read one book in your life... I strongly recommend that you keep your mouth shut"). Part of the original Comedy Zone line-up at Edinburgh, with Stewart Lee, Mark Lamarr and Chris and George. Simon made his first appearance on the comedy circuit hosting his first cabaret night at The Market Tavern, Islington. The shows proved to be the forerunner to his critically acclaimed confrontational futurist komedy kabaret, Cluub Zarathustra. Simon was the creator of Alan Parker - Urban Warrior - a self-appointed spokesperson for the dispossessed generation and prophet to the disconnected masses who seeks to smash the system with subversion, some placards and a spray-can. IN 1996, Alan Parker-Urban Warrior starred on ITV's Saturday Live and appeared in his own BBC2 show London Shouting which was written with Father Ted (C4) creator, Graham Lineham. In February Simon enjoyed a two weel sell-out run as Alan Parker at The Adelaide Comedy Festival. The third and last series of Alan Parker's 29 Minutes of Truth (BBC Radio One) was broadcast in May. The series won the Sony Gold Award for Radio Comedy. Simon was nominated for Best Television Newcomer for London Shouting (BBC2) at The 1996 British Comedy Awards. The League Against Tedium had his own six part series on BBC Radio One. In August, The League Against Tedium hosted Cluub Zarathustra, 'the most original and inventive cabaret you will ever see." (The Sunday Times) at The Edinburgh Festival. Taking artistic control to the extreme, audiences were made to weare dunces caps, were disinfected with spray guns, humiliated, parodied and finally forced out of the auditorium by the spectacle of the entire cast, which included Stewart Lee, Julian Barratt, Sally Phillips and Kevin Eldon, dribbling onto the stage. Following his Australian success in 1996, Simon was invited to perform a three-week run at The Melbourne Comedy Festival as The League Against Tedium. The League Against Tedium sold out three weeks at the 1998 Edinburgh Festival. The show was recieved with out-right critical acclaim. In December, following the sell-out success of his '98 Edinburgh show The League Against Tedium performed three nights at The ICA. Incorporating an operatic device with a repertoire that included a ballad about the Corby 5000 Electric Trouser Press, computer animation and live televisual images. The League Against Tedium was invited back to the 1999 Melbourne Comedy Festival for a three-week run in April, follwing his last appearance in 1998. Following the success of his first London ICA shows, The League Against Teidum took up residence at The Lyric Theatre, Hammersmith for his first ever London run. Running for three weeksthe show was met with critical acclaim (again), one reviewer demanding that he be appointed the BBC's next direcor general. Simon's first TV show, FuturTV was broadcast on UK Play (now BBC3), throughout June. The 13 x 15 minute one-man show proved beyond all doubt that The League Against Tedium is the future of television. In August, UK Play broadcast Either Or, a 13 x 30 minute game show written and presented by The League Against Tedium. The League was also nominated for the Perrier Award at the Edinburgh Festival. In October, The League Against Tedium performed a three-week run of his Perrier nominated Edinburgh show, I Am TV, at London's ICA. Following a sell-out run in New York City, in February, The League performed at the Aspen Comedy Festival. Simon returned to the Edinburgh Festival with The League Against Teidum, I Am I Will, his follow up to the previous year's show, I Am TV. Simon filmed 6 x 30 minute series Attention Scum, for the BBC. This was promtly not-recomissioned by the then BBC2 Controller before it had even aired. The show did get airplay, but one images Jane Root grinding her teeth throughout. But it's all right, she's gone now. Attention Scum, starring The League, was premiered on BBC2 and BBC Choice in January. Attention Scum was nominated for a Golden Rose of Montreux. Simon performed at the Melbourne Comedy Festival. Simon performed Noble Thoughts of a Noble Mind at the Edinburgh Festival. Simon was invited to perform at the Toronto Comedy Festival. Simon recorded a series of monolouges called Where Did It All Go Wrong? for BBC Radio 4. This included The True Confessions of Sherlock Holmes, among others. Simon played the part of Mad Solomon in BBC2's The Private Life of Samuel Peyps, starring Steve Coogan. Simon Performed Trilogy, including Onward and Upaward, Buckethead: The Way of the Bucket, and the short play The True Confessions of Sherlock Holmes, at the Edinburgh Festival. Simon performed Trilogy at the Melbourne International Comedy Festival. Simon returned to the Edinburgh Fringe Festival with two shows, a play, Buckethead: Phenomenon Anon And On, and Simon Munnery's AGM. Buckethead was then performed t the Soho Theatre, London. Simon recorded a second series of Where Did it All Go Wrong? for BBC Radio 4. Simon hosted 'Weakly Chats' on Resonance 104.4 FM. The chat show based show featured guests Arthur Smith and Jeff Green among many others. The show ran for 33 weeks.